A group of us traveled from Chicago and points West out to State College, PA for the Northwestern / Penn State football game this past weekend. This trip was planned well in advance, and since we were flying into Pittsburgh at around dinnertime Friday, I naturally researched chow opportunities. Bear in mind that the group was seven late thirties / early forties males on their way to a college football weekend. Burgers came immediately to my mind. On CH, the same name kept coming up again & again - Tessaro's. Then a little more internet research. This Article sealed the deal. Any place that takes their burgers seriously enough to have their own butcher on staff & grind the meat in house daily, not to mention cooking them on custom made wrought iron grills over hardwood, gets my vote. We arrived at 7:30 p.m. and literally could not even get in the door of the place it was so crowded, so we retreated to a local watering hole for libations for about an hour. When we went back, the crowd had thinned out to the point that we could all get inside, but there were only two open spots at the bar, which runs almost the full length of the place. We took those two & the rest of us stood until our table was ready (almost another hour). Tessaro's is in a really cool old building, with what looked to be the original tin ceiling still in place. The walls are exposed brick. It is dimly lit, with Iron City & several varieties of Yuengling's beers on tap (of course, we went with the local product) - the bar runs down the middle & the outer walls are ringed with booths & tables. We put our name in for a table & ordered a couple of appetizers (two of the "gourmet" burgers, each cut into four pieces) - when these came, any faint doubts that we might have had about our choice of restaurants were immediately erased. The meat was very juicy, with a higher amount of char on the outside than I am used to, but not burnt-tasting at all. The options were pretty straightforward - bacon, cheese, mushrooms, onions - blue cheese was fifty cents extra, and you had the option of "dry" (crumbled) or "wet" (dunno - maybe like a blue cheese derssing?) blue cheese. For sides, you had the option of home fries (kinda like half-mashed potatoes), boiled redskins, potato salad, or steamed veggies (no fries). 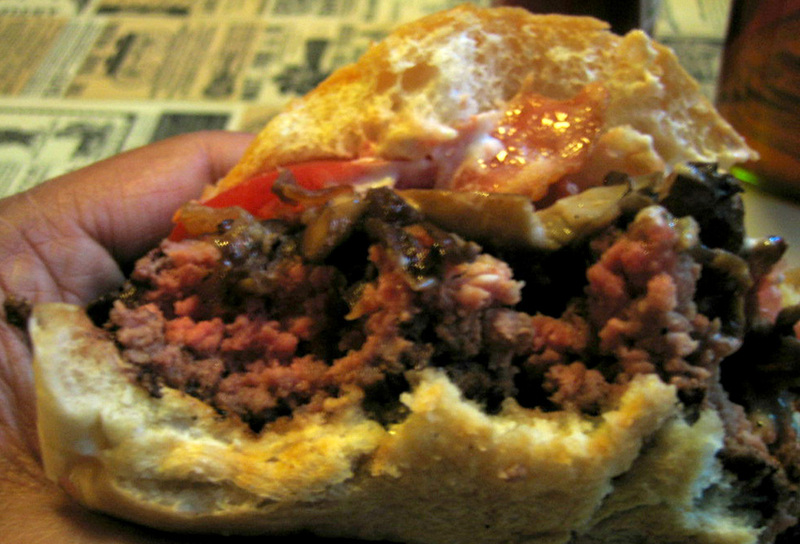 I went with the gourmet (bacon, mushroom, onion) burger with blue cheese option (dry). w/ mayo & spicy mustard on the side. The bun was soft & kind of a standard bun - nothing special there. Nothing special needed. The patty is the clear star of this sandwich. I looked around the table, and noticed that nobody was saying anything - everyone was so intent on inhaling their burgers. All of us agreed that it was the best burger we had ever had. IMHO this place set the bar against which all burgers will be judged from now on (at least by me). I must have heard people mention Tessaro's at least a hundred times the next day at the game, and we were all bitterly disappointed to find that they were closed on Sunday when we returned to Pittsburgh to fly home. Tessaro's also offers steaks, ribs, and seafood, but I'd estimate more than 75% of what we saw coming out of the kitchen was burgers - and I understand why. I am trying to figure out another excuse to get to Pittsburgh just so that I can go back to Tessaro's..... Don't the Cubs play the Pirates there next summer? I exist in Chicago, but I live in New Orleans. The place in Pittsburgh I am dying to try is Primati's. Re: Primati's - don't bother. We ate there when we found out Tessaro's was closed & the consensus amongst the same group that loved Tessaro's so much was that Primati's was awful. I split a double meat capicola and a double meat sardine with one of the guys in the group, and they were both terrible. Packing a sandwich with undercooked fries and very mediocre slaw only gets you cold, soggy fries that overwhelm the sandwich. Also their "special" fries (can't remember the exact name for them, but they promised chili, cheese, sour cream, and bacon) totally skimped on the sour cream, and used velveeta instead of cheese & bacon bits (the crappy oscar mayer kind from the can), instead of bacon. Primati's is in a really cool old market district, though, and I bet you could pick any of a small handful of restaurants nearby at random and do much better than Primati's. As the the grandson of a Heinz factory worker (maybe you saw it across the river from the Strip), I must say that your Primanti Bros. experience was marred (1) by the place's somewhat inconsistent character but also (2) by a catastrophic judgment error in your ordering. Capicola, sardine? Those are the two meats I've never seen anyone order. They are on the menu, granted. 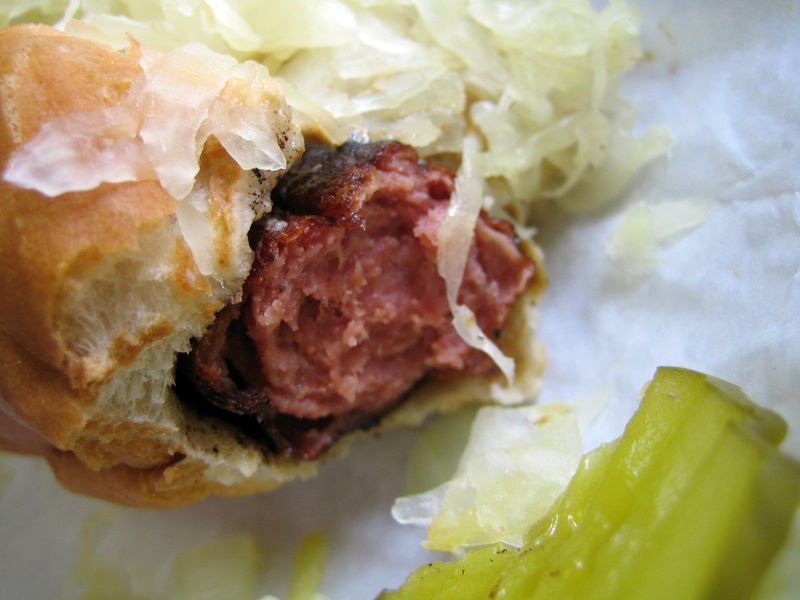 So too are pizza puffs and tom tom tamales on the menus of several solid Chicago beef stands. Consider my post on all sorts of eats (esp. sandwiches) around the great lakes, including in Toronto, a fantastic food town. My single greatest experience was, hands down, a Primanti's sandwich for breakfast on the Fourth of July, before Kerry's speech. Then again, the masterful main cook was manning the grill. and we had his full attention. Skin-on fries were being cut and fried to order for the sandwiches. Bread, bakery-warm, cut to order with a knife. (Even Langer's uses a slicer for the bread.) The polar opposite fry-on-sandwich experience. Next time, go with pastrami and a fried egg or chipped chopped ham and an egg. I believe that those sammies were awful, I do. I know that the fries and bread can be otherwise than my last experience. I'd say your experience was unusual but certainly not unprecedented. I'd have to say, however, that "don't bother" is strong advice coming from a one-off experience. JeffB wrote: I believe that those sammies were awful, I do. I know that the fries and bread can be otherwise than my last experience. I'd say your experience was unusual but certainly not unprecedented. Those sammies were awful, and so were the other FIVE that we ordered. I wish I could remember what kind the others were (they weren't capicola & sardine), but everyone in the group thought the place was abysmal. It was on a Sunday, and the Steelers were playing the Eagles at home, so they might have had a big pre-game rush or something, I dunno. Whatever it was, this place did not inspire enough confidence in me to even consider making a return visit the next time I'm in town. It seemed to me like one of the places that people are taken to when they are kids & thereafter associate fond memories with, but really aren't that good. Well, I'll just beat the dead horse once. I was there this summer, and it was great, fantastic I'd say. The other hundred or so folks on hand maybe thought so too. I don't really consider that too relevant to my own experience. The fries in particular were stellar. If the fries had been cold and rancid, I'm sure that the sandwiches would have stunk, as did yours. These things happen. I had a particularly disturbing meal at a well-respected Chinese restaurant here (not LTH), which I described in some detail on another board. It was an outlier experience, it turns out, and I somewhat regret the publication, though it was completely accurate. But it's impact was minimal, I'm sure. 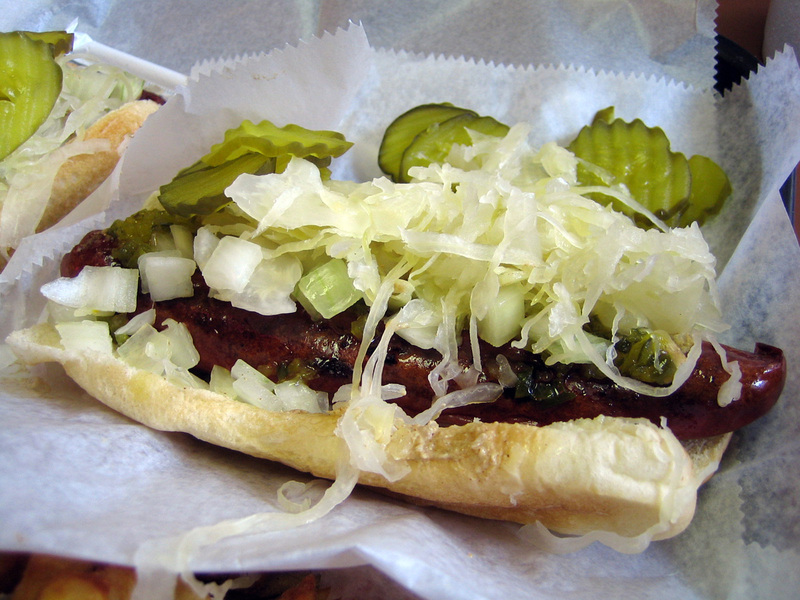 Like Primanti Bros., the place gets overwhelmingly good reviews. I have nothing to gain by shilling for a tourist-friendly (but not a trap) sandwich shop hundreds of miles away. I do have my multiple experiences, however, and you had yours. We're both right. PS, I just re-read your post and saw a reference to the fries with cheese and bacon. While I agree that the cheese whiz isn't great, and I don't enjoy that stuff on cheesesteaks or stadium nachos either, I shared an order this summer and remember how good the bacon (not bits) was. It's like you got "gringoed" at an American restaurant. Maybe they have a second menu for yunzers (nickname for people from P'Burgh and surrounds who use "yunz" as the plural of "you"). Anyway, the Steelers game angle makes sense I'd bet you were there at the end of a very, very long day for the staff. Biggest game of the year for P'Burgh not to mention the rest of the league this year thus far. Still, no excuse. PS, sure the Cubs play in Pittbsurgh next year, being in the same division and all. 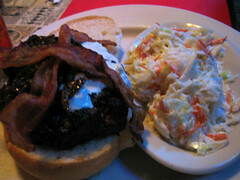 JeffB wrote: PS, I just re-read your post and saw a reference to the fries with cheese and bacon. While I agree that the cheese whiz isn't great, and I don't enjoy that stuff on cheesesteaks or stadium nachos either, I shared an order this summer and remember how good the bacon (not bits) was. It's like you got "gringoed" at an American restaurant. Maybe they have a second menu for yunzers (nickname for people from P'Burgh and surrounds who use "yunz" as the plural of "you"). That wasn't really even really that big a deal, it just further detracted from the experience. They would have been fine w/ real bacon. FWIW we were the only people in the place, as the game had just started. I didn't pick up any bad vibe from the staff. Maybe they were just too lazy / tired to fry up some bacon & figured we 'yunz were just tourists anyhow. JeffB wrote: Anyway, the Steelers game angle makes sense I'd bet you were there at the end of a very, very long day for the staff. Biggest game of the year for P'Burgh not to mention the rest of the league this year thus far. Still, no excuse. OK - Let's compare the two places mentioned in this thread. Same group of diners, same city, same weekend. We went to both places on the tail end of a huge crush of orders. Tessaro's hit one out of the park. Premanti Brothers whiffed like Sammy Sosa with men on base. JeffB wrote: PS, sure the Cubs play in Pittbsurgh next year, being in the same division and all. Of course they do. That was more of a rhetorical question. If there's a weekend series, I might even go. If I do, I'll be eating at Tessaro's. 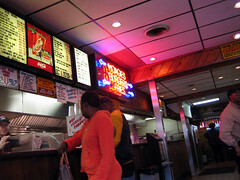 As a Pittsburgh native, I grew up eating at both Tessarro's and Primanti's and, along with the Original Hot Dog ("The Dirty O"), they are touchstones in any self respecting yinzer's (yinz=yunz) past. Yes, maybe Primanti's is particularly susceptible to the rosy colored memories of adults, however, as I believe they now have maybe four or five outlets across the city, I'm not terribly surprised that you experienced a quality control issue--especially on a game day. Those sandwiches may look sloppy, but they are carefully constructed from unstable elements. Mancini's Italian bread, fresh and sturdy as it is, simply cannot contain the stack of competing fat slicked fillers. And of course, that's the way it's supposed to be. 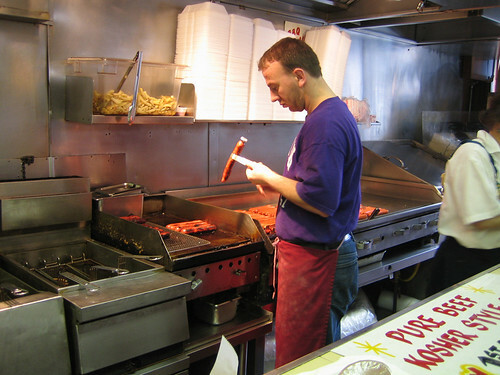 I would encourage you to not write off Primanti's, and further reccommend you give it another shot on a less frenetic day, when your grill man isn't worried about the point spread--either the Strip District location or the Oakland shop. I'm partial to the roast beef, and the egg--even when it's not Lent. m'th'su wrote: I would encourage you to not write off Primanti's, and further reccommend you give it another shot on a less frenetic day, when your grill man isn't worried about the point spread--either the Strip District location or the Oakland shop. I'm partial to the roast beef, and the egg--even when it's not Lent. FWIW, we were at the Strip District (original) location, 1 p.m. or thereabouts on a Sunday. I could be convinced to give Primanti's another shot next time I am in town, but I would not be willing to go very far out of my way to do so. While we're on the topic of Pittsburgh, any other spots (besides the hotdog place you mentioned) that are worth checking out? Last edited by ChiNOLA on November 10th, 2004, 1:45 pm, edited 1 time in total. As long as we are on the subject of Pittsburg, when I was there for business, I had one dish a few times, and I really loved it, and it seemed like a real popular thing. I forgot the exact name, but it was a bit like Primati's on a salad. That is, salad with tons of shredded cheese and french fries. Who knew, but boy did it work. I had it at a popular restaurant on the top of the hill where the trolly goes up. Jeff? I think you're thinking of the ubiquitous "steak salad" (wish I had a more poetic name) and the Tin Angel. Yes, steak salad. Now, that would be easier to duplicate here in Chicagol, no? Just down the street from Tessaro's is a little Polish bar called the Bloomfield Bridge Tavern, with terrific pierogies, fried in butter. If I'm not mistaken they come from one of the many South Side Catholic churches, handmade by squadrons of babas (the BBT is not on the South Side). Though I wouldn't recommend it to many, there's a pizzeria called Anthony's, also on the South Side, that touts the infamous pierogie pizza, consumption of which risks a slow suicide by starch. 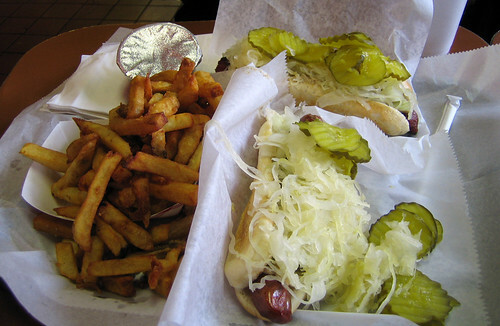 I've never had a hot dog in Chicago that beats the grilled, slightly charred natural casing wieners at the Original Hot Dog in Oakland, also deservedly famous for its fries. 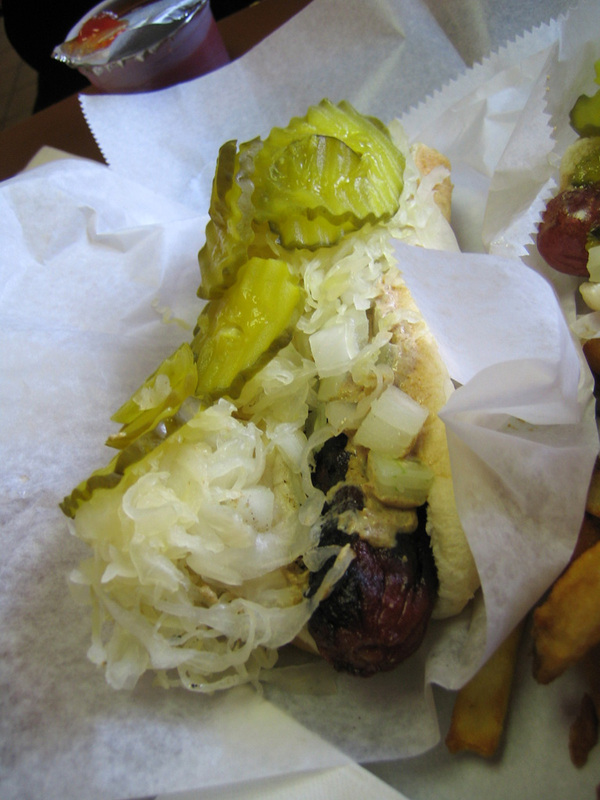 m'th'su wrote: I've never had a hot dog in Chicago that beats the grilled, slightly charred natural casing wieners at the Original Hot Dog in Oakland, also deservedly famous for its fries. My best buddy in high school was from Pittsburgh, and he insited the hot dogs were better there too, something I found hard to concieve. At least I've now (years later) heard a second to the motion. Well, judging solely from the pictures here, I'd say Original Hot Dog is certainly worth a try. On a short trip to Pittsburgh, LTH and LTHers really made my day. Only had a few chances to go out on our own so here's the little I can add. 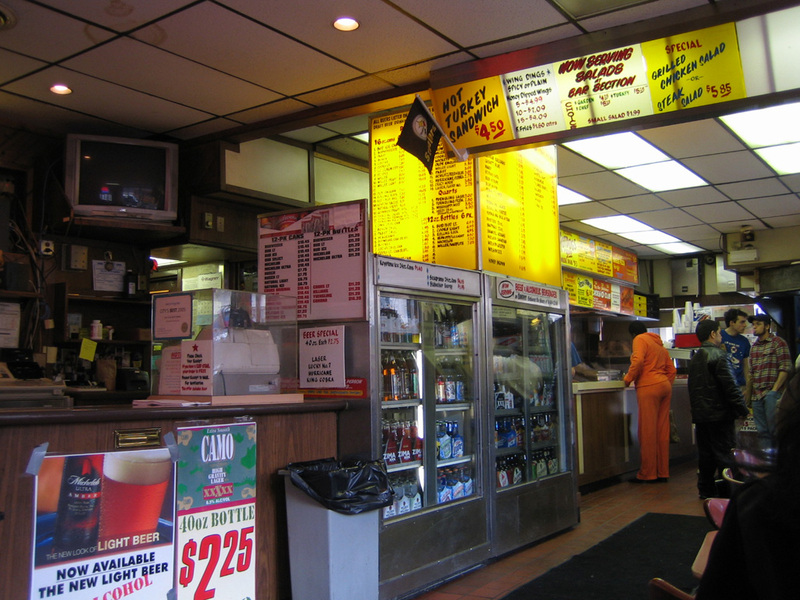 There's not too much I can add about a Pittsburgh institution like the 'O', one of three Pgh essential eateries (according to a Pgh blurb poster Geo kindly emailed me). We went in fairly late for lunch on a weekday and boy, was this a treat! There was a lot to take in visually first. In fact, I was so busy taking it all in I stood in the wrong place first. 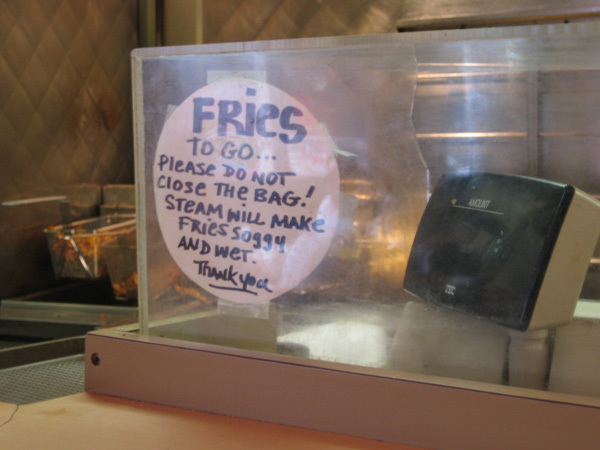 After staring at a sign on the wall that had the three boxes for sizes of fries – small (feeds 1-2), medium (feeds 3-4) and large (feeds 5-6) – I remembered Geo's note warning that the smallest would suffice. Then realizing, rather being prodded in the ribs and being pointed around the corner, I saw the hot dog ordering area was separate. Hot dogs here - at various stages of char. All beef dogs are to the left. I did also see a small poster with "Vienna Beef" on a wall. 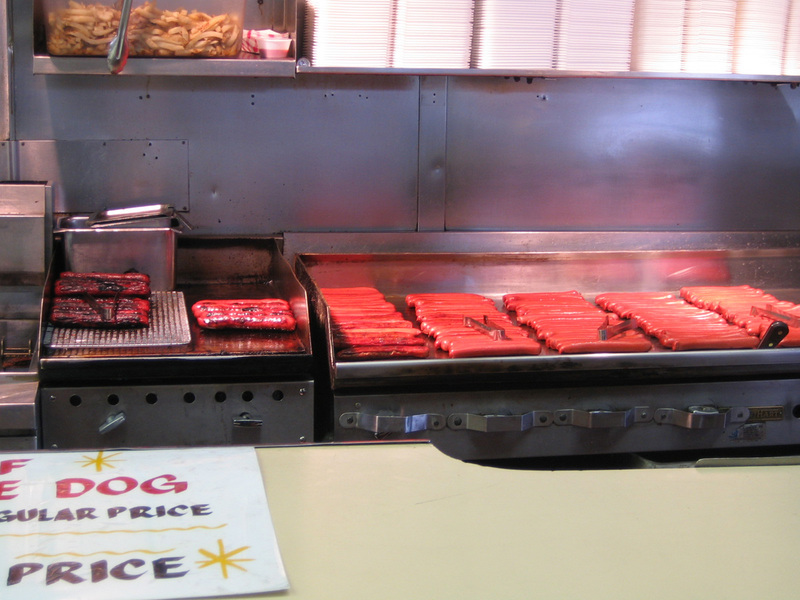 Needless to say I eagerly awaited our order – a hot dog with everything (well, no chili) – medium done, a beef dog with everything (these are the leftmost ones in the picture above) – A2Fay wanted this well done, and small fries (ketchup came in the foil capped container). The hot dog was excellent – taut skin that went kerplink as my teeth sunk into it and through to the soft juicy inside. I'm not particularly fond of sauerkraut (though I don't dislike it) but I liked it with this hot dog as it lent a pleasing crunch with a mild tang. I really enjoyed the flavour of my dog, though the all beef dog A2Fay got was even more delectable. Yes, small fries (note 'small' basket underneath). The fries were measured out in the large basket which was then overturned onto the small basket on our tray. Ah! These are fries! They really should have another name for fries like these. It isn't fair to them that they share the same name with other limp insipid impostors. A few hours since our arrival in Pittsburgh, this lunch really put a smile on my face. I was looking forward to the rest of my trip. On a Wednesday night around nine, there were quite a few empty tables and we were seated quickly. Quickly scanning the menu (we had come for the burgers) I was delighted to see mention of the five levels of doneness the burgers could be ordered – from rare (red, cool inside) to well done (dry, allow twenty minutes). I bit into mine and whimpered softly. I couldn't believe I was having such wonderful a second meal on the same day. The burger had a great charred outside, I don't know how it was so pink so close to the outside. Juicy, tasty, umm, umm, umm! The 'gourmet' burger was $8, I would happily pay double. (A2Fay's was less). The sides were a good supporting cast to the stellar burger(s). Outside a thunderstorm started and raged, the streetlamps and traffic lights went out, but burger in one hand and a glass of Penn Pilsner in the other, I was happy and ready for Pittsburgh. My many thanks to previous posts and threads on LTH (like this one) as well as tips from Chicago bound binkin and a wonderful writeup from Geo. Ah sazerac! you did Da 'Burgh proud, and made my mouth water, just thinking about all those wonders you experienced. Tnx for an excellent, indeed compelling, report, with some wonderful pix. Me 'n TODG are really pleased that you liked our ol' stomping ground. And just think: there are so many further wonders that await you: Saturday morning on the Strip, a quiet afternoon for you and A2fay at the Frick, a fish sandwich at Wholey's, etc. etc. etc. Enjoy wildly, and keep us apprised of your progress! Geo wrote: And just think: there are so many further wonders that await you: Saturday morning on the Strip, a quiet afternoon for you and A2fay at the Frick, a fish sandwich at Wholey's, etc. etc. etc. Enjoy wildly, and keep us apprised of your progress! Saturday morning on the Strip was fabulous... breakfast at DeLuca's, wandering in and out of some great stores - Wholey's, Pennsylvania Macaroni Co. etc. etc. etc. Then we had to bolt to keep some appointments. We were back for a late lunch at Primanti Bros.
Now you've tipped my hand, I'll try and process the pics soon. Pittsburgh was enjoyable - I look forward to being back there again. I can't believe I stumbled on this thread tonight. I've been living in Pittsburgh the last two years and the owner of Tessaro's my landlord! I'm moving away tomorrow though and am just about to take a final walk down Liberty Avenue to pick up a burger. Sniff. Can anyone suggest good alternatives in Philly? Leaving Da 'Burgh... never a happy prospect. But then, I've heard that one *can* find a bite or two in Philly. Keep us posted! Thank you ChiNOLA for finding Tessaro's! We drove into Pittsburgh today and needed a place to eat after 11pm. The kitchen closes at 11:30, we were still on the turnpike at 11:00, and we weren't sure where we were going. Thanks to your review I was able to call ahead. The wonderful woman who answered the phone, Ena, gave us excellent directions and even took our order while we were driving in so everything would be ready when we got there; talk about service! Tessaro's is a rustic dark wood and tin ceiling old fashioned bar with some of the most amazing burgers I have personally ever tasted. Perfectly cooked over hard wood, medium rare, half pounders. 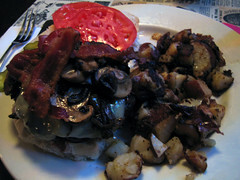 One was topped with creamy bleu cheese and bacon, the other with cheddar, grilled onions and sauteed fresh mushrooms. Fantastic fat content, very juicy, and full rich beef flavor. The fact that Tessaro's burgers have never been on anyone's national "Top 10 Burger" list is just further proof of the worthlessness of such foolish lists. For sides we had a fresh cut cole slaw with what tasted like a touch of sour cream. The potato salad was made from fresh red skin potatoes and might have had bit of that bleu cheese tang in them. Man that was good eatin'! In appreciation for Ena's help we gave her a couple of bottles of Roadhouse Bar-B-Que Sauce ("Original Recipe" & "Texas Tango") which she said she would try out on a slab or two during tomorrow's (Thursday) weekly rib special. Thanks again ChiNOLA for a fantastic rec! Actually, I've seen Tessaro's on such lists. They are collected on A Hamburger Today. Still, a fine reco. "The visit to Pittsburgh was her first, and she ended it with a stop at Tessaro's in Bloomfield on her way to the airport. She and her staff picked up seven cheeseburgers with sides of home fries, but the votes of patrons she glad-handed weren't as forthcoming. . . "
At least Michelle Obama did better than Kerry did. He told everyone in Milwaukee that he was on his way to Speed Queen and Kopp's, and then, instead, ended up downtown in that fancy Italian steakery. When the food critic for the JS, who followed him downtown just in case, saw that, he blew Kerry's cover in the paper the next day. When Clinton told everyone in KC he *really* wanted some Bryant's burnt ends, hell's bells, he bought for his plane and the *press* plane too. ChiNOLA wrote: All of us agreed that it was the best burger we had ever had. IMHO this place set the bar against which all burgers will be judged from now on (at least by me). sazerac wrote: I bit into mine and whimpered softly. I couldn't believe I was having such wonderful a second meal on the same day. 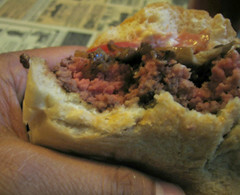 The burger had a great charred outside, I don't know how it was so pink so close to the outside. Juicy, tasty, umm, umm, umm! Stopping in Pittsburgh on the way to DC, we met sazerac at Tessaro's. It was great seeing him again and great to try a Tessaro's burger. The burger at Tessaro's was one of the best I've ever had. I kept it simple: medium rare with grilled onions. This was a good choice because it let the flavor of the beef (dead-on medium rare, as ordered) shine through. The meat is freshly ground (Tessaro's has a butcher on staff) and grilled over a hardwood fire. You can tell. That's Cathy2's blue cheese bacon burger in the background, another good choice. The problem with eating at Tessaro's is that other burgers just don't measure up. Shortly after returning to Chicago I tried a cheddarburger at Paradise Pup. While it was a good burger, they're really not playing in Tessaro's league. ChiNOLA wrote: Re: Primati's - don't bother. While I agree wholeheartedly with your assessment of Tessaro's I don't share your opinion of Primanti's. I thought the roast beef and fried egg sandwich was a brilliant assembly, very much a case of the whole being greater than its parts. Next trip to Pittsburgh (honestly, I'm very much looking forward to visiting again) another Primanti sandwich will definitely be high on my list. ChiNOLA wrote: Also their "special" fries (can't remember the exact name for them, but they promised chili, cheese, sour cream, and bacon) totally skimped on the sour cream, and used velveeta instead of cheese & bacon bits (the crappy oscar mayer kind from the can), instead of bacon. We pretty much agree here. I thought the fries themselves were very good but found the toppings abominable. 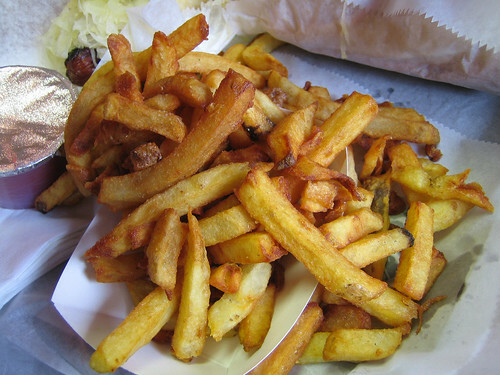 I can't recommend the Smallman Street Fries. After Primanti's we wandered around the Strip, stopping on the street for bindae duk (mung bean pancake) at Sam Bok. The fried fish sandwich at Wholey's looked spectacular and not ordering one was our biggest regret of the trip. We stopped in a bunch of other places including DeLuca's (crowded), Enrico Biscotti (great place), Mon Aimee Chocolat (impressive stock beautifully displayed) and LaPrima (excellent espresso but I think the interior has been remodeled). We were in a bit of a hurry leaving Pittsburgh, so we could get to Baltimore in time for Faidley's, but were able to stop at The O for a quick hot dog. As advertised, it was a natural casing beauty, griddled to crispness, really a superlative sausage. It's a shame we didn't have more time in Pittsburgh. I was very impressed and hope to get back soon to explore a bit more. You did very very well! But I can't believe that you didn't get a Wholey's fish sand!! Sazerac, shame on you! you should have insisted!! Oh well, next time. Of course you got the fries at The O, right? right? right? The nearest place with fries as good as the O's is here, in Montréal. Ah, Da 'Burgh! My *other* Home Town... So glad you enjoyed it! Geo wrote: But I can't believe that you didn't get a Wholey's fish sand!! Sazerac, shame on you! you should have insisted!! Sazerac did highly recommend Wholey's fish sandwich. We even watched them being made which makes it even more incomprehensible why we didn't order one. All I can say is we had a lot of eating planned for our brief visit to The Strip. Sazerac mentioned Original Oyster House as a backup for a fish sandwich and that's what we decided on. Unfortunately we arrived at OOH during peak lunch rush so we had to abandon that plan. Looks like a good place though. Next trip. That was my mistake. I ordered the dogs at the front counter, forgetting that fries can only be had at the back. Cathy was circling the block in miserable traffic so I decided not to wait in another line. I was well aware of the fries' reputation and was sorry to miss them. It didn't seem quite so important at the time since we had just had a double dose of Primanti's fries (not to mention some spectacular ones at Belgrade Gardens the day before). Like I said, next trip. It's pretty clear we didn't hit Primati's when they were firing on all cylinders, but I've figured out what I don't like about their sandwiches: Hot, greasy french fries + cold, wet slaw = cold greasy mess. I much prefer the New Orleans approach to french fries on a sandwich: Hot, greasy french fries + hot beef gravy = heaven. These sad events occurred in May, 2009. Anyone know the current status of Tessaro's?